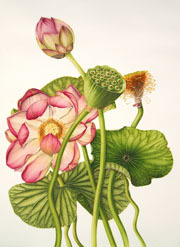 Nelumbo nucifera is commonly known as the lotus. The genus name is derived from the Sinhalese word Nelum (which means blue); species name from the Latin for nut-bearing (nux = nut, fera = bearing). Known also as Sacred Lotus or Indian lotus (not to be confused with waterlilies) the lotus is an aquatic perennial native to India and Bangladesh and is the national flower of both India and Vietnam.